There's a quiet revolution happening in organizations. Until recently, helping managers and employees improve their ability to perform was the responsibility of HR staff, corporate trainers, consultants, and hired professional coaches. If you asked a supervisor what he or she was doing to help team members be better team members, the typical answer was, "That's not my job." But why shouldn't a first-line supervisor want to help direct reports get better at what they do? For that matter, why shouldn't team members help each other perform better? It would only make their jobs easier! The answer is that they don't know how to play that role. They have no confidence in their ability to coach someone who is trying to improve. 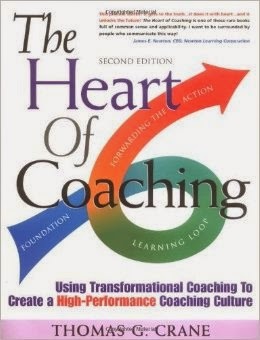 The solution presents itself in Thomas G. Crane's book, The Heart of Coaching, 4th Edition. The vision and purpose of the book is to help organizations establish a coaching culture, in which people at all levels take an active role in helping others in the organization work on improving skills. The Crane's transformational coaching model has three simple phases: Foundation, Feedback, and Forwarding-the-action. Crane is a superb writer, and he clearly describes what's involved in each of these phases. The latter part of the book delivers all the how-to instruction and tips anyone would need to be effective in the coaching role. Imagine the benefits to an organization if it successfully established a coaching culture! Learning would be so much easier. Performing at a high level would become commonplace. Human interactions would be mutually supportive. Who wouldn't want to work in an environment like that? If this possibility excites you, I strongly recommend that you read and study The Heart of Coaching, one of the best business books of 2014.